The language of puppetry is a good language for teachers. A teacher works with other human beings in order to facilitate their acquisition of knowledge. She can be an important influence in the lives of her students for she has the potential to create the point of reference for the students� experience of learning. Establishing various avenues of communication in the classroom is vital to the process of learning, and puppetry can provide such an avenue, which would be accessible from many side streets. 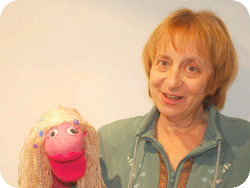 Puppetry provides a safe haven for communication. If the student does not feel safe expressing his feelings, his experiences or his questions, his curiosity may be suppressed. Curiosity is the basic element for learning. If it is not present, learning cannot happen. Puppetry provides an alternative, safe form of expression as it transfers ownership of what is said to the puppet. The puppet can say whatever needs to be said without implicating the puppeteer in the eyes of the audience. Puppetry enables experiential learning, learning which is retained in the being of the learner, not merely stored in the brain. In 450 B.C., Confucius said, �Tell me, and I will forget. Show me, and I may remember. Involve me, and I will understand.� Puppetry requires involvement, and it makes the experience fun. Planning, designing, and performing a puppet show require a community effort. It requires group cooperation and the building of a sense of �we�. This coming together for a common cause is another example of experiential learning. Hopefully, it can provide a good basis for the understanding of belonging; whether in an immediate sense, such as family or in a global sense, such as to the family of man. Puppetry requires encountering and experiencing many art forms, which in turn can enhance the learning experience. For example, creating a puppet, a form of the visual arts, can heighten self-appreciation. The artist may be proud of his ability to create a visual representation that is pleasing to him and to others. The dramatic arts can help an appreciation of others evolve. This can happen when using puppetry in such scenarios as role-playing or problem solving situations or in enactment of historical or current events. It involves refinement of the written language in preparing scripts. Searching for and finding the right music for a puppetry presentation establishes a connection with nonverbal communication. Music is universal and can burrow a path to the soul. Using puppetry in the classroom is fun and special, and it can make a teacher glow!